In user research we’ve seen that users are finding it hard to scan long A to Z lists of content titles on specialist sub-topic pages. This blog post describes some improvements to specialist browse pages we're making to address this issue. For some specialist sub-topics, we’ve also found instances of specialist users wanting to see the mainstream content relating to that sub-topic as well as the specialist guidance. For example, immigration lawyers often need to see the content written for visa applicants - their clients. They have a need to see all content across GOV.UK relevant to a particular sub-topic on one page. Similarly we’ve found that if a user with mainstream needs, for example around intellectual property, ends up on a specialist sub-topic page like trade marks, they’re often looking for signposts to introductory information about the sub-topic on this page. Our hypothesis was that users would find it easier to scan long lists of content titles if the content on the page was grouped into logical themes with labels that help signpost users to the content they’re looking for. We also wanted to test whether navigation could be improved if the order of the labels and content titles was curated (e.g. based on popularity, importance or ordered by the steps in a process) rather than being presented alphabetically. Relevant mainstream content could also be grouped, labelled and positioned in a way that would route users with mainstream needs to the content designed for them. 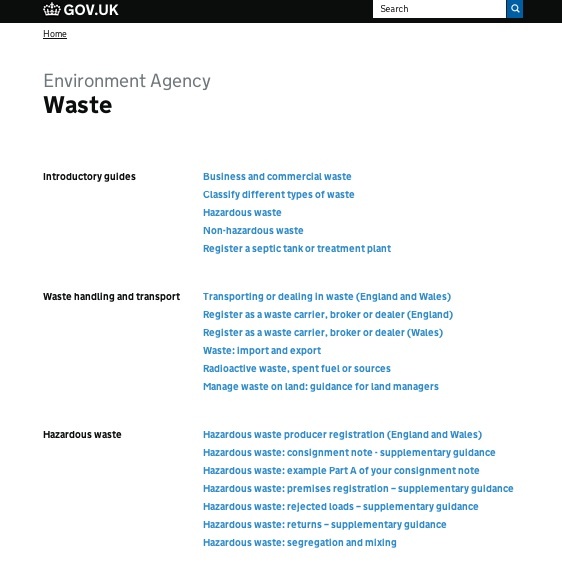 The screenshot below shows the prototype page for Environment Agency’s waste sub-topic. It pulls together mainstream and specialist content, and groups related content items into meaningful categories. During user research (with 6 participants relating to each organisation) we found that presenting the content in this way performed well. Having the sub-headings and breaking the content up made the page easier to navigate than A-Z lists which rely on users knowing exactly what they’re looking for. We’re currently building this optional functionality for sub-topic pages. Content titles which are not part of a group will be listed in A-Z order at the end of the page. Audience labels should be used with caution. We’ve found in user research that it’s hard to describe all the audiences that might be applicable. This means it’s easy to exclude people for whom the content might be relevant. Initially this functionality will be available to GDS editors only. GDS content designers will be able to help you organise and label your content. This functionality is optional and won’t be useful or necessary for specialist sub-topic browse pages displaying short A-Z lists of titles which don't form meaningful sub-groups. The new features will be available in 4 to 6 weeks. Where issues such as this arise with the new presentation format, organisations may wish to edit their content titles (bearing in mind that the titles will need to work for search as well). Thanks for this update Vicky. Great to see this flexibility being introduced to avoid long lists of links. Has GDS done any thinking yet around how people actually get to the pages? They're not indexed in site search and they're not referenced from the mainstream topic page (such as https://www.gov.uk/browse/environment-countryside/recycling-waste-management). We've observed some online discussions from external customers where they feel the GOV.UK content is too general and not specific enough for them, suggesting they don't know these specialist pages exist. Thanks for your feedback. Yes, these are both features that the Search and Browse team are currently working on, and we'll be able to update you soon.